Fake Rocks are designed to hide hideous pipe lines in your yard or that annoying loud pump and filter system on your pool. The Low Profile rock from DekoRRa Products measures 36 inches long x 36 inches wide x 9 inches high and weighs only 12 pounds. 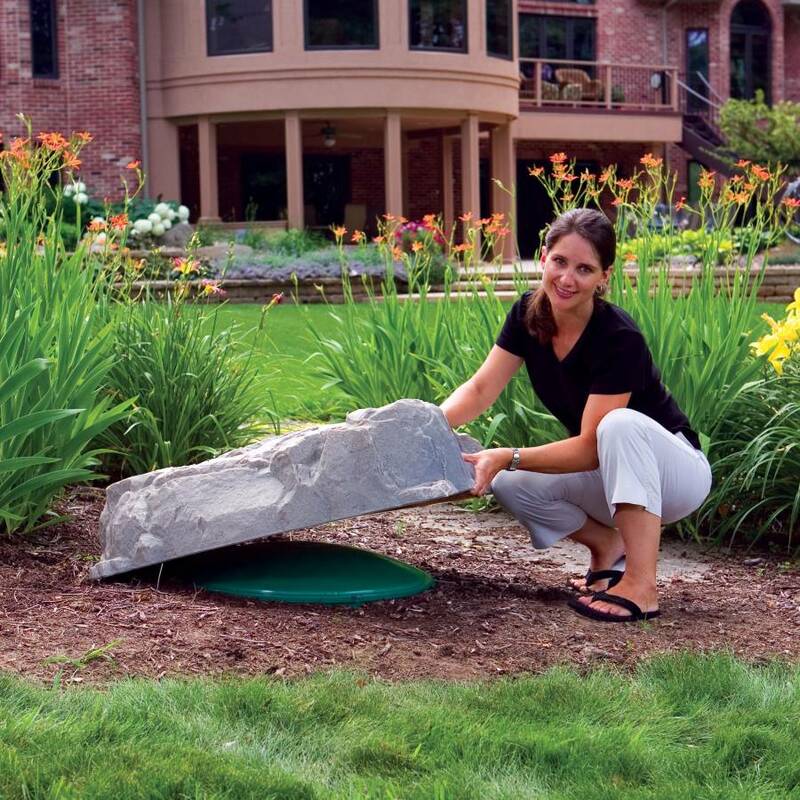 The Low Profile Model 112 is just the right size for covering low profile septic risers and man holes up to 30 inches in diameter and 7 inches high, 30 inch lids with a junction box, and grease traps. All DekoRRa rocks are made with an all-new textured material called RealRock™. With RealRock™, not only do you achieve incredibly realistic aesthetics, but also unmatched longevity in virtually any climate. Its commercial grade construction stands up to the elements, and since the color and texture are part of the material rather than painted on, you will enjoy these great looking enclosures for many years. Faux rock enclosures are lightweight and constructed of recyclable materials. Heavy duty ground stakes are included to keep your rock enclosure secure. A 3 inch louvered vent and a 4 inch screen vent are available for use with pump systems. The DekoRRa rock enclosures are available in four colors: Fieldstone/Gray, Riverbed/Brown, Sandstone and Autumn Bluff. When choosing a rock enclosure for an application, note the shape of the rock as well as the application measurements. Made in the U.S.A. Availability: Usually ships in about 1-2 weeks.